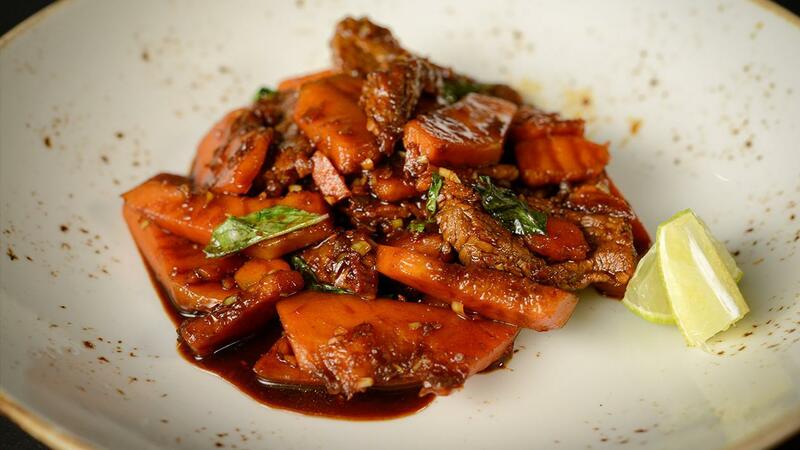 Sweet and savory dish with mellow Thai flavors. Just serve with rice. Remove green skin of kabocha with a knife. Scoop seed out and cut into quarters and then cut into ¼ inch strips. Cut flank steak diagonally across the grain into 2 to 2 ½-inch strips, no more than ¼-inch wide. Lightly season beef with salt. In a wok on high heat, put in 2 tablespoons vegetable oil. Once hot, stir fry beef in the wok until seared. Remove from wok and set to the side. Add in 15 gram of oil and add in garlic, shallots, ginger and lemongrass. Stir fry for 30 seconds until fragrant. Add in the palm sugar, Oyster soy sauce (or Mushroom soy sauce as an alternative) and Knorr® Professional Liquid Concentrated Beef Base. Partially cover and simmer for 15 minutes until kabocha softens. Put beef back into wok with kabocha. Add in Bird’s Eye Chili and Thai Basil Leaves. Stir to combine and heat the beef. Finish with a squeeze of lime juice from a ¼ of a lime and serve. Note: If using a pan on a stovetop rather than wok, sauté in batches.